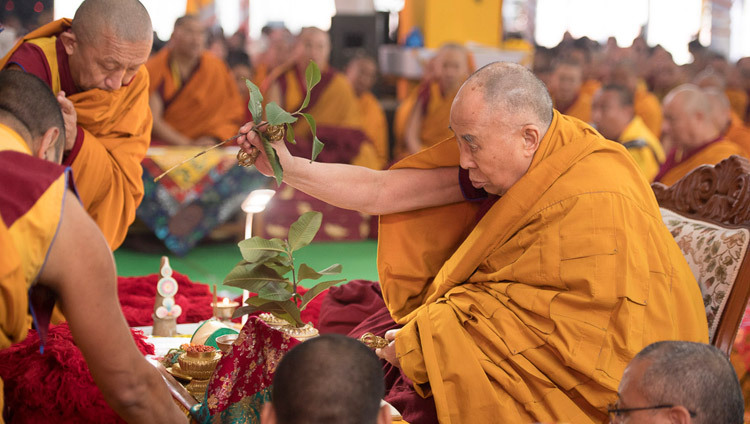 Bodhgaya, Bihar, India – This morning, His Holiness the Dalai Lama made the short journey from the Tibetan Temple to the Kalachakra Maidan, greeted the gathering crowd and sat down facing the mandala pavilion. He spent the best part of an hour conducting the rituals and meditations necessary to prepare himself to begin the Thirteen Deity Vajrabhairava Empowerment. While he did so the Gyütö Chant Master led repeated recitations of the ‘Praise to Manjushri: Glorious Wisdom’s Excellent Qualities’ and his ‘ara patsa na dhi’ mantra. Once His Holiness was ready and had mounted the throne, recitation of the usual verses of salutation from ‘Ornament of Clear Realization’ and ‘Fundamental Wisdom’ was augmented with Je Tsongkhapa’s ‘Foundation of All Excellence’. “Today, the main disciples are the monks of Gyümé and Gyütö Tantric Colleges,” he explained. “Of the various aspects of Yamantaka, today I’ll be giving the preparation for the aspect involving thirteen deities. Both the New Translation traditions and the Older Nyingma tradition have practices of Manjushri in his fierce, wrathful aspect. Indian masters like Nagarjuna relied on Manjushri, as did masters from all the Tibetan Buddhist traditions. There are practices of Manjushri that involve tantra and others that don’t. The aspect of Manjushri we are seeking to accomplish today is the wrathful form of Yamantaka. A unique aspect of the practice, however, is that it combines peaceful and wrathful practices. It is said that wrathful feats come about as an incidental result of specifically peaceful practice and vice versa. “Of all the Highest Yoga Tantra practices, I received Yamantaka first from Tagdrak Rinpoché. In addition, I have cultivated the practice of Manjushri since childhood and can attest that it is effective in increasing wisdom. Dispelling the darkness of the three worlds. “We can also do the practice of Manjushri in conjunction with the Hundreds of Deities of the Joyous Land— (Ganden Lha gya ma) to increase discursive, clear, swift and profound wisdom. His Holiness observed that the main quality to qualify as disciples for the empowerment is faith in the teaching and the Guru. He went on to extol a non-sectarian approach, emphasizing the importance of harmony among spiritual traditions. He pointed out that the First to the Fifth Dalai Lamas were all non-sectarian and although Gendun Gyatso, the Second, made his residence at Drepung, he was widely known as the ‘non-sectarian yellow hat lama’. 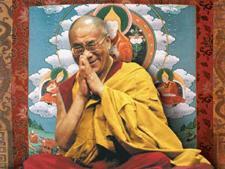 The Thirteenth Dalai Lama too maintained this tradition and received teachings from Tertön Sogyal. His Holiness suggested there are many advantages to being non-sectarian and that if we don’t learn from each other, it’s our loss. The Gyütö and Gyümé Abbots, representing the main disciples, offered the mandala and threefold representation of the Buddha’s body, speech and mind. An effort had been made to accommodate as many monks from the two monasteries as possible in the central part of the stage in front of His Holiness. Acknowledging other members of the audience, His Holiness referred to those from China, Vietnam, Korea and Japan as fellow adherents of the Sanskrit tradition of Buddhism. Noting that students from America and Europe are not traditionally Buddhist, he recognised that many are attracted to Buddhism as a science of mind. He was wisdom supreme, teacher supreme.